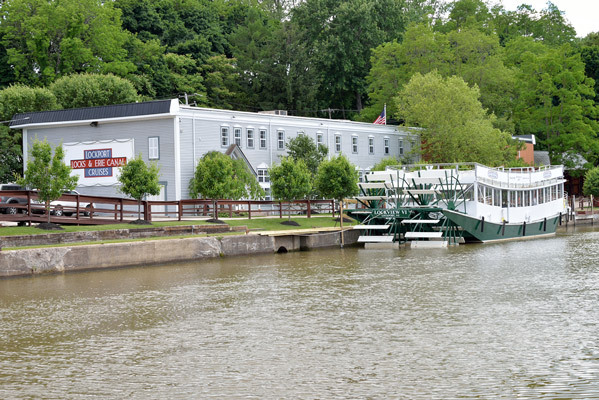 In 1987, Mike and Sharon Murphy started Lockport Canal Tours with two pontoon boats and a dream. 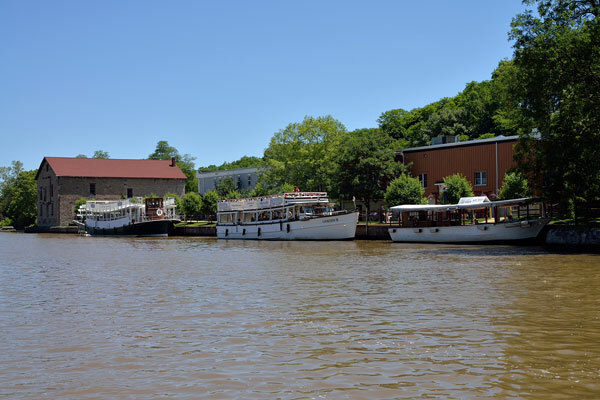 Today, the business, now called Lockport Locks & Erie Canal Cruises Inc, has blossomed into one of Niagara County's most popular tourist attractions. With the acquisition of their property located at 210 Market Street in Lockport, the company can also boast having Western New York's unique banquet and meeting facility. The main building, originally built in the 1840's has been renovated to resemble an 1800's Canal town. With over 100 windows overlooking the historic Erie Canal, the Canalside (open year-round) houses banquet and meeting space for over 200, a Café, gift shop and outdoor landscaped picnic area with 100 foot shelter to accommodate 300. The original stone walls are the remains of what was once Niagara Preserving Company, one of the first companies to effectively preserve food in metal containers. The property was also at one time Western Block Company, a business that manufactured block and tackle for pulleys used on canal boats. Many of these artifacts can still be found throughout the spacious building. Across the parking lot from the main building stands a 4-story stone building also built in the 1840's. At one time the building was a flour mill that used the water from the Erie Canal as its main power source. The water was brought down an open aqueduct (known as a "raceway") in order to power a waterwheel. The remains of the "raceway" can be seen in the sheltered picnic area. The excess water was then discharged into a spillway, which is adjacent to the building (this spillway also served as a passage for runaway slaves as part of the Underground Railroad). Today, the spillway still carries water under the canal, into 18-Mile Creek and down to Lake Ontario. 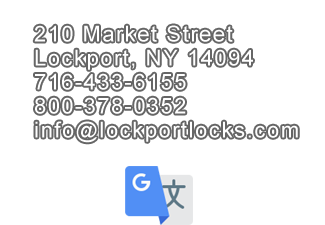 The building (kept in its original condition) serves as the Lockport & Erie Canal Heritage Museum with hands-on canal related exhibits, a working model of a lock, and many interesting, and educational displays and artifacts. 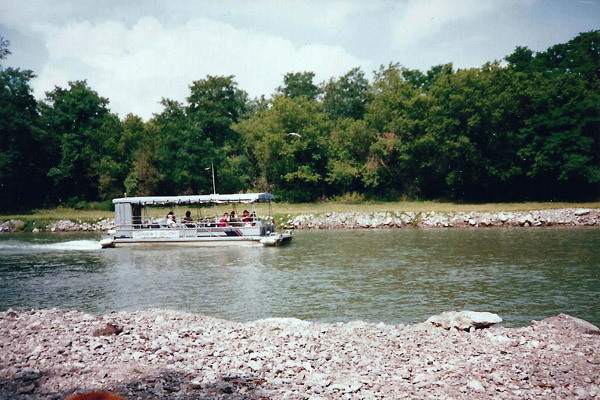 Time sure has flown since we went into business the summer of 1987 using a single 18 passenger pontoon boat named the Lockview I. Twenty-eight years later we are still plying our trade using boats that dwarf the original. 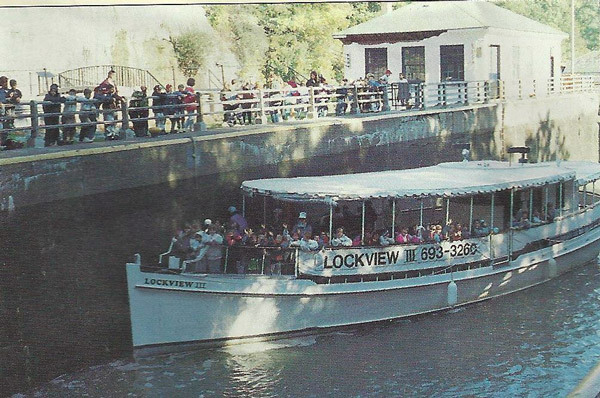 Below is a photo of our original vessel, Lockview I, with Capt. Mike at the helm. Lockview I was a twin to our second boat, Lockview II. Here is our third "retired" boat, Lockview III. Each year we meet and greet people from across Western New York, New York State as a whole, the United States and just about every continent. We want to thank everyone for helping us to grow. The story of the Erie Canal, and the fabled Flight of Five Locks need to be told and remembered. We hope to continue to play our part in the telling for years to come!